Minister of Transportation, Rotimi Amaechi. 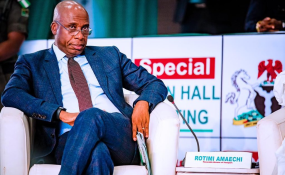 Minister of Transportation, Rotimi Amaechi, said weekend he hoped the next minister in charge of the ministry would deliver ongoing projects in the railway subsector. Amaechi, who spoke during a routine inspection of the ongoing Lagos - Ibadan standard gauge project being undertaken by the China Civil Engineering and Construction Company, CCECC, tasked the contractor to complete the civil works before the commencement of rain. Speaking against the backdrop of fears that many of the present crop of ministers might not make the next cabinet, Amaechi said should he fail to make the government, whoever would take his position in transport ministry would pay attention to the rail sector. He was, however, quick to add that his reappointment was the prerogative of the president who had the statutory powers to appoint ministers. He said: "If you watched me as governor, I was always restless at delivering on my responsibilities. I pray whoever would be the Minister for Transport should have the same passion and focus on that responsibility. "I know as a minister, it is stressful. I'm stressed up and all that. But as a minister you have a responsibility that the president has passed to you and you must deliver. "The second thing is that the economy of Nigeria can be driven most importantly if you can link the seaport to the hinterland because when these cargoe come, they must go. "The more you are able to move goods and cargoe to the hinterlands, the more you create jobs; and the more economic growth you have." The inspection took the team, comprising officials of the ministry and Nigerian Railway Corporation, NRC, from the railway compound at Ebute-Meta, Lagos, to the end of the project in Ibadan.